With almost as many food options as there are vegan, bike-serviced, wind-powered yoga studios, Portland is saturated with outstanding nourishment. The good news: If your destination is anywhere near downtown, one obvious dining choice shoots way to the top of the list – Higgins on SW Broadway. 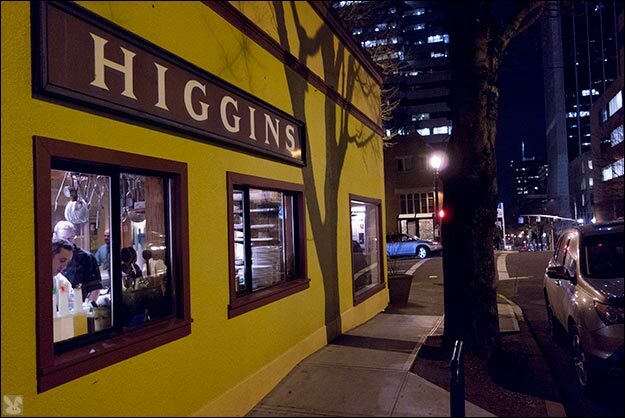 A mainstay of the downtown and regional dining establishment for almost 20 years, elegant yet casual, Higgins is a great place to eat and hang out. One measure of success is the diversity of the Higgins fan base. On any given night business people in slick corporate cover sit in the bar one booth over from kids in t-shirts, shorts and sandals. And the food? Oh yes. Yes, please. Well if you thought the food at Higgins couldn’t get any better – turns out you may have been wrong. Starting this week, all Higgins beef will be 100% grass fed. After 19 years of trying, the restaurant has found a single source to provide all its beef products grass fed and in just the right way. Where’s the magical place with beef good enough to go underneath the tomato and onion slices on a world famous Higgins burger? It is Carman Ranch, a fourth generation farm in Wallowa, Oregon. This welcome development won’t make it any easier to decide what show to see. Oregon: Still the right place. God’s country (and beef) beneath the Wallowa Mountains.